This thread is dedicated to the history of fishing on Lake Simcoe. We will be posting vintage pictures of anglers with their catches, or anglers fishing on Lake Simcoe. If anyone can identify the individuals in any of these pics, or has any details / stories you can share, please do, I'm sure our community would love to hear about it. The pics will be numbered 001, 002, 003 etc. Just reply to this topic and reference the pic if you have something to share. If you would like to share a vintage Lake Simcoe fishing pic pre-1900 to 1960, please email me info@lakesimcoeoutdoors.com or post it with all known details. Thank-you Thorahguy for supplying these great vintage pics of Lake Simcoe's History. If you can identify anyone in this photo, please share your knowledge. If anyone out there can identify any of these guys and/or date the pic - please share. If anyone out there can identify any of these guys I would be grateful. If anyone can identify either of these gals and/or date the picture, please do. If anyone can provide any information about this pic, please do. It used to be hard work making a hole in the ice! If anyone can provide any additional information about this pic, please do. A spear fishing handle can be seen through the roof of this hut. 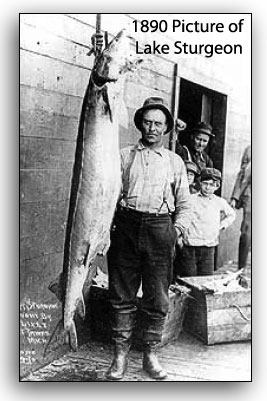 Spear fishing was banned on Lake Simcoe after 1940. Geez Jerry, where did you get that? I've got the same one in B&W, didn't know anything about it. Since 1959 seems to qualify as vintage, here's my first Ontario trout in 1958. (I came to Ontario in 1955.) It's not Simcoe though, it's near Dorset.